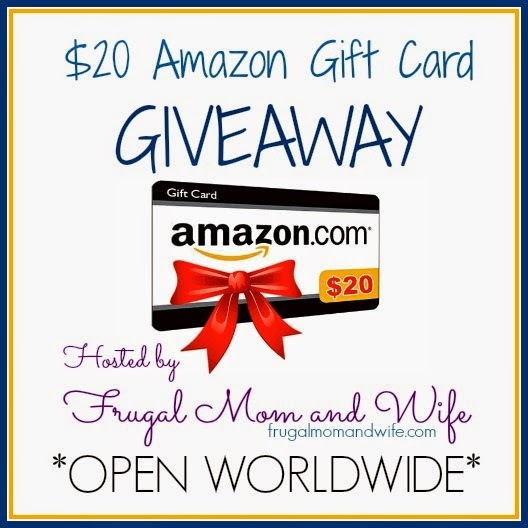 Frugal Mom and Wife: $20 Amazon Gift Card Giveaway! OPEN WORLDWIDE! WINNER ANNOUNCED! $20 Amazon Gift Card Giveaway! OPEN WORLDWIDE! WINNER ANNOUNCED! If you could use an extra $20 Amazon cash this giveaway is perfect for you. Whether you choose to use it on yourself, family or friends it doesn't matter. It's completely up to you how you spend your winnings. Just a little something to help you out from Frugal Mom and Wife. Simply enter by using the giveaway tool below. Bookmark this page and come back for daily entries! PLEASE SEE GIVEAWAY TOOL BELOW FOR WINNER INFORMATION. Disclosure: This giveaway is sponsored by Frugal Mom and Wife. Information provided to enter this giveaway with the tool above is used solely to select and verify the winner. No other parties are connected to this giveaway in any form. Frugal Mom and Wife only hosts the most awesome giveaways because fans are wonderful! I will totally spend every single penny on myself. Simply because everyone broke at Christmas. Thanks for the chance. I 'dbuy gifts. I have a lot of birthday's to buy for in the next few months. I would use it towards getting a story book for my nephew. I would use it to buy black computer ink. I'd use it for a birthday gift for my husband. Being a sahm I'd be fun to surprise him! I'd use it for some home office goodies! I'd put it toward a Blu-ray player my husband has in his Amazon wish list for his Valentine's Day present. I'd get some books for myself and my mom! I would like to use this gift card for my dad. He has a worn out wallet and he wouldn't change it. I would use this 20$ gift card plus the money I saved to buy him a brand new wallet. A wallet better than the one I will buy him with my saved up money alone. thanks, lovely chance! I'd like for clothes! I'd use it for healthy food products for the family. I would buy new ebooks to read. I would buy my sister and nice gift! Some jewelry on Amazon! I would use it on my mom.